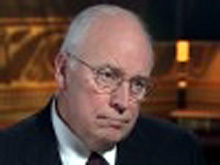 Cheney on ABC: "I think those who allege that we've been involved in torture, or that somehow we violated the Constitution or laws with the terrorist surveillance program, simply don't know what they're talking about." Of course waterboarding is a form of torture. Just take in consideration the fact that no other civilized nation utilizes this as a tool of interrogation or intelligence gathering. Besides, such methods never generate good or reliable intelligence.